The CTK-6200 offers 48 notes of polyphony so you don’t have to worry about dropping notes. Using the sustain pedal for multiple notes, playing big chords, adding rhythms and layering sounds can deplete the polyphony memory quickly resulting in dropped notes. When searching for a keyboard, take the amount of polyphony into consideration. The CTK-6200 can store 4 sets & 8 banks for a total of 32 set ups. The simplicity of the registration process makes it a great feature for live performances. 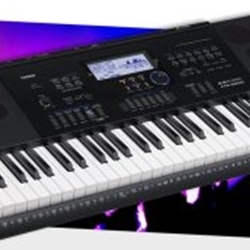 Casio’s CTK-6200 includes 210 preset plus 10 user-created rhythms, which is more than comparable models. Additional rhythms expand your music composition, creativity and fun.